Simplistically, LOI is the percentage of weight a material loses on firing. Assuming firing to a typical stoneware temperature of 1200C, the amount of weight loss can be surprising. Kaolins, for example, lose around 12% (mainly crystal-bound water). Ball clays lose about half of that (a combination of crystal water, organic carbon and sulfur). Many raw stoneware, earthenware and fireclays can have high sulfur content (high enough to create a strong odor during firing). Carbonates decompose and gas off CO2. Dolomite and calcium carbonate lose over 40% of their weight and copper carbonate is not far behind. Barium carbonate loses 20% plus and lithium carbonate a whopping 60%. Gerstley Borate and Colemanite are other high weight losers (20%+). Even feldspars lose some weight (usually less than 1%). LOI can also be other things (e.g. chlorine, oxygen, fluorine; the latter might break down quickly in one use but linger in a melting glaze or frit). Each of these materials has its own thermal history, losing weight at one or more temperatures as it decomposes with increasing heat (some materials can actually qain weight at certain temperatures; non-oxide materials, for example, capture oxygen from the atmosphere or other materials). LOI is a big problem in firing of many types of ware, and must by minimized. Some of these materials can be calcined for some uses (e.g. some of the kaolin in glazes). Others cannot be calcined because their raw properties are needed (e.g. plasticity of clay) or they become unstable (e.g. carbonates). The oxides of others (needed for glazes) can be sourced from frits (e.g. boron). Lower carbon ball clays can be used in bodies. Stains can be employed instead of metallic carbonate colors. Calcia and magnesia for glazes can be sourced from wollastonite and frits instead of calcium carbonate or dolomite. Notwithstanding all of this, the mechanisms that produce gases in many of these materials happen at fairly low temperatures and defect-free fired product can actually be done using bodies and glazes having significant LOIs. How? Those who fire kilns concern themselves with the temperatures at which weight loss events occur in the bodies and glazes. Engineers can use instruments (e.g. DTA devices) to create a weight-loss profile of the entire firing range of a body that contains multiple materials having an LOI. Or a simple study of the materials used can produce the same information (although less precise). In periodic kilns the firing curve can be flattened in the zones of high gas generation. Potters have often learned by experience when and where to fire faster or slower. In many industries where tunnel kilns are used the firing curve is much less flexible. And firing must be done quickly (fast-fire is less than three hours cold-to-cold). 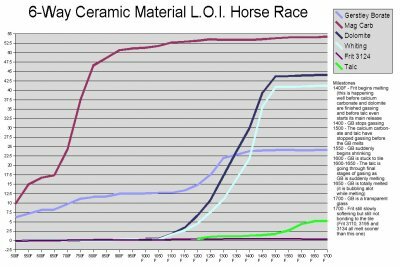 Weight loss profile information would liley be used to choose a bisque fire curve and temperature tuned to burn away all volatiles (thus preventing all body gas related defects in the glaze). But in other industries (like tile, brick) ware must be single fired in tunnel kilns. Obviously, technicians have a challenge to produce quality ware, so knowledge of LOI information is doubly important. Technicians doing chemistry have an entirely different perspective of LOI. In glaze chemistry, we think of LOI as being like the shells thrown away from a bag of nuts (if you need 1 kilo of peanuts that might mean needing to buy 2 kilos of shelled nuts). It is likewise with glaze materials. For example, 100 grams of generic kaolin going into a kiln sources only 87.5 grams of Al2O3 and SiO2 for glass-making. To get 100 grams of SiO2 ane Al2O3 we would need 100/0.875 or 114.3 grams of the raw kaolin powder. Digitalfire desktop Insight used to store materials in its MDT (materials database) as formulas. 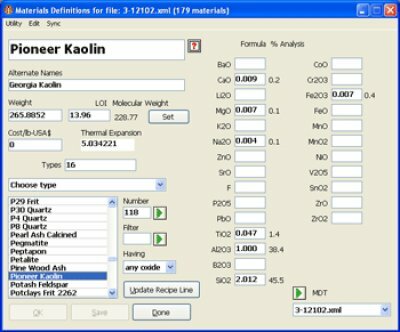 So generic kaolin, for example, had to compensate by recording a formula weight of 253.9 instead of 222.2 (Insight was able to calculate the 12.5% LOI from that differenxe). Insight-live.com now stores material chemistry as analyses, the LOI is specified as a percentage along with the other oxides. When the LOI for each material in a recipe is known, it is easy to calculate the LOI of the raw recipe as a whole. Insight-live does that automatially when it displays the chemistry of recipes. Because of this it is possible to use simple procedures (within an Insight-live account) to substitute materials having lower or zero LOIs into glaze recipes without changing the chemistry (different materials source the same mix of oxides). Huge increases in glaze quality can be realized, for example, by sourcing oxides like Li2O, BaO, B2O3 from frits instead of the high-LOI raw materials that supply them. If you have an analysis lacking an LOI figure, or suspect the accuracy of the analysis delivered by a lab, then you can weigh, fire, and weigh again to derive the actual LOI and compensate the analysis. Following is the mathematical method of applying a 5% measured LOI to an existing analysis which had no specified an LOI. How much gas escapes firing from cone 03 & 04? These were fired to cone 03 (upper) and 04 (lower). At cone 03 the loss in weight is 4.54%, at 04 it is 4.45%. That is 0.08% difference. If a mug weighs 250 grams, that is only 0.21 grams. Does not sound like much. But wait. Air weighs 0.001225g/cc. While this is not the exact weight of the gases escaping during firing it suggests that around 170cc of gases need to bubble up through the glaze if the piece was bisque fired at cone 04 and glaze fired to cone 03. 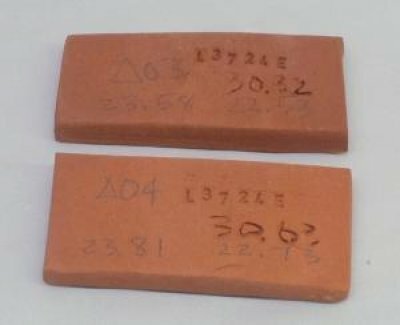 By preparing these three tests you can measure many properties of a clay body. These include drying shrinkage, fired shrinkage, porosity, drying performance, soluble salts content, water content and LOI. Desktop Insight can calculate the LOI of a recipe based on the LOIs it knows of the individual materials in the recipe. But sometimes you need to impose an LOI to force a calculated analysis to match an actual measured LOI in the lab. The LOI appears below the material name and alternative names (beside the weight). The formula that goes with that LOI is the bold numbers in the blanks beside the oxide names on the right. Here is a screenshot of side-by-side recipes in my account at insight-live.com. It takes 120 mag carb to source the same amount of MgO as 50 mag ox. 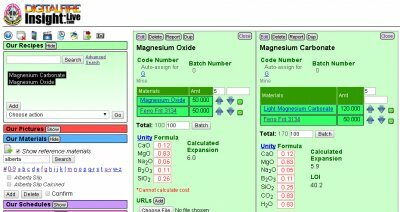 I just made the two recipes, went into calculation mode and kept bumping up the magcarb by 5 until the chemistry was the same. Note the LOI of the magcarb version is 40. This one would certainly crawl very badly. Fired at 1850. Notice that Frit 3195 is melting earlier. By 1950F, they appear much more similar. Melting earlier can be a disadvantage, it means that gases still escaping as materials in the body and glaze decompose get trapped in the glass matrix. But if the glaze melts later, these have more time to burn away. Glazes that have a lower B2O3 content will melt later, frit 3195 has 23% while Frit 3124 only has 14%). 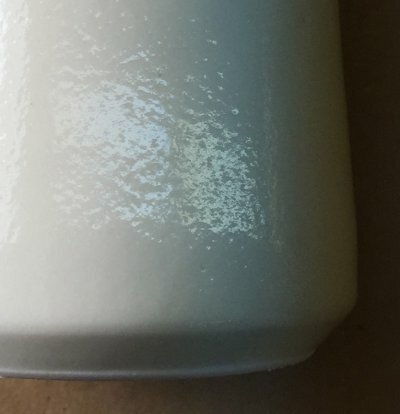 Does this terra cotta clay have an LOI higher than kaolin? No. These two samples demonstrate how different the LOI can be between different clays. The top one is mainly Redart (with a little bentonite and frit), it loses only 4% of its weight when fired to cone 02. The bottom one is New Zealand kaolin, it loses 14% when fired to the same temperature! The top one is vitrified, the bottom one will not vitrify for another 15 cones. Laguna Barnard Slip substitute fired at cone 03 with a Ferro Frit 3195 clear glaze. The very high bubble content is likely because they are adding manganese dioxide to match the MnO in the chemistry of Barnard (it gases alot during firing). Orange-peel or pebbly glaze surface. Why? This is a cone 10 glossy glaze. It should be crystal clear and smooth. But it contains strontium carbonate, talc and calcium carbonate. They produce gases as they decompose, if that gas needs to come out at the wrong time it turns the glaze into a Swiss cheeze of micro bubbles. One solution is to use non-gassing sources of MgO, SrO and CaO. Or, better, do a study to isolate which of these three materials is the problem and it might be possible to adjust the firing to accommodate it. 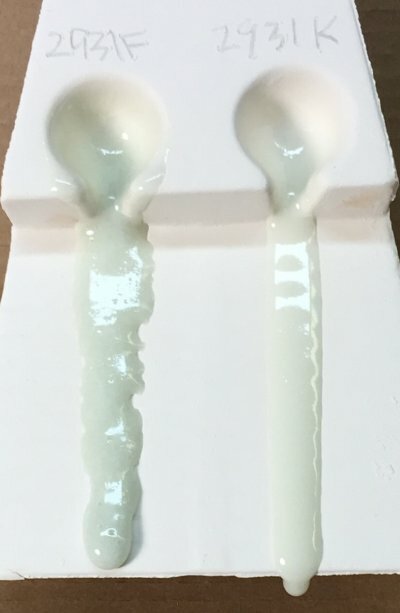 Or, an adjustment could be make to the chemistry of the glaze such that the melting happened later and more vigorously (rather than earlier and more slowly). The latter is actually the likely cause, this glaze contains a small amount of boron frit. Boron melts very early so the glaze is likely already fluid while gases that normally escape before other cone 10 glazes even get started melting are being trapped by this one. 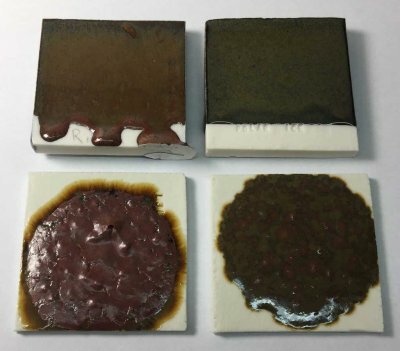 I melted these two 9 gram GBMF test balls on tiles to compare their melting (the chemistry of these is identical, the recipes are different). 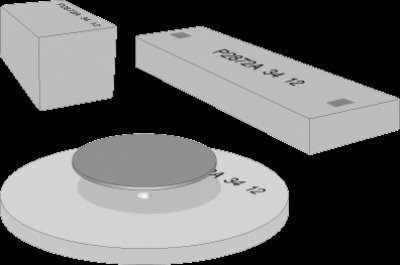 The Ulexite in the G2931F (left) drives the LOI to more than 14%. That means the while the ulexite is decomposing during melting it is creating gases that are creating bubbles in the glass. Notice the size of the F is greater (because it is full of bubbles). While this seems like a serious problem, in practice the F fires crystal-clear on most ware. 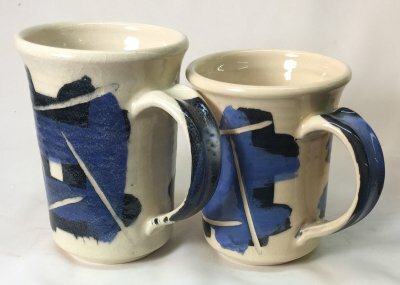 These two glazes have the same chemistry but different recipes. The F gets its boron from Ulexite, and Ulexite has a high LOI (it generates gases during firing, notice that these gases have affected the downward flow during melting). The frit-based version on the right flows cleanly and contains almost no bubbles. At high and medium temperatures potters seldom have bubble issues with glazes. 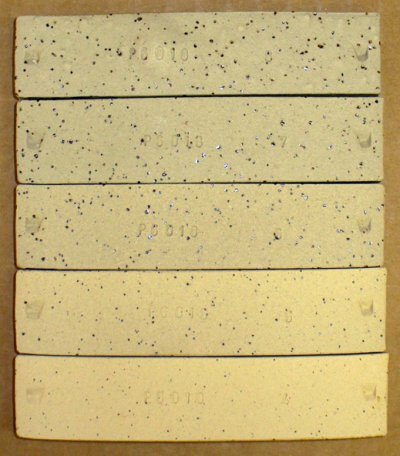 This is not because they do not occur, it is because the appearance of typical glaze types are not affected by bubbles (and infact are often enhanced by them). But at low temperatures potters usually want to achieve good clarity in transparents and brilliance in a colors, so they find themselves in the same territory as the ceramic industry. An important way to do this is by using more frits (and the right firing schedules). 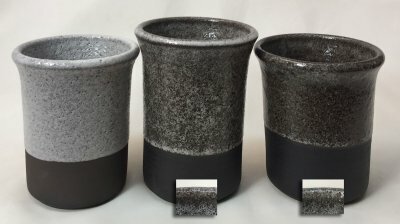 A cone 6 stoneware with 0.3% 60/80 mesh manganese granular (Plainsman M340). Fired from cone 4 (bottom) to cone 8 (top). It is normally stable to cone 8, with the manganese it begins to bloat at cone 7. The particles of manganese generate gases as they decompose and melt, these produce volumes and pressures sufficiently suddenly that closing channels within the maturing body are unable to vent them out. 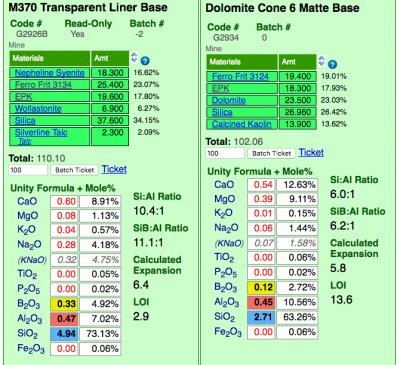 Insight-live is calculating the unity formula and mole% formula for the two glazes. Notice how different the formula and mole% are for each (the former compares relative numbers of molecules, the latter their weights). The predominant oxides are very different. The calculation is accurate because all materials in the recipe are linked (clickable to view to the right). Notice the Si:Al Ratio: The matte is much lower. Notice the calculated thermal expansion: The matte is much lower because of its high levels of MgO (low expansion) and low levels of KNaO (high expansion). Notice the LOI: The matte is much higher because it contains significant dolomite. This black body is made by Seattle Pottery Supply. Surfaces like this are obviously not functional, but for decorative ware? Yes! How does this happen? This body contains a material that is adding to its LOI (likely raw or burnt umber). Not just that, but the gases are being expelled at the wrong time. How is that? The glaze is fluid at cone 6 and begins melting way down around cone 04. It is melting long before the gases of decomposition from the body are finished being expelled. So they have to bubble up through the glaze, creating the effect you see here. This body is actually over-mature and brittle at cone 5, but at cone 01 its strength is fairly good. Fired at cone 6. The samples on the bottom tiles are from ten-gram balls that have melted down. These glazes have the same chemistry, but the one of the left sources its B2O3 from Gerstley Borate (which has a high LOI). The one on the right gets it from a frit. Because the fritted version has less gases of decomposition to expel, the glass is much smoother. Curiously, the fritted version is flowing less and the red color has been lost. Why? This could be because the Al2O3, which stabilizes glazes against excessive fluidity, is being dissolved into the melt better and more available for glass building. A detailed look at what materials contain organics, what its effects are in firing (e.g. black core), what to do to deal with the problem and how to measure the amount of organics in a clay material. Part of changing your viewpoint of glazes, from a collection of materials to a collection of oxides, is learning what a formula and analysis are, how conversion between the two is done and how unity and LOI impact this. INSIGHT enables you to enter material analyses as recipes as a first step to inserting them into the materials database. Imposing an LOI and understanding how to set unity and its connection for formula weight are important concepts.